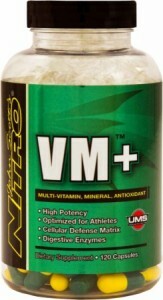 The V/M+ supplement is a multi-vitamin for those working out casually and for those that are looking to make some sort of career of exercise, body-building, or powerlifting. V/M+ has a wide array of inclusions that will increase individual health considerably. The supplement includes CoQ10, which has been associated with greater heart health. A full complex of vitamins and minerals are here (Vitamins A, B1, B2, B3, B6, B12, C, D, E, K, Selenium). Calcium, Chromium, Molybdenum, and Potassium round out the mineral component, assisting with overall bone health and nervous system functioning. I believe that the strongest inclusions here has to be ZMA; evidence has supported their strength-facilitating effect as well as their ability to decrease zinc deficiency (many Americans do not receive a proper amount of zinc on a daily basis). Other inclusions that are unique to the V/M+ supplement would have to be the Complex of Bromelain and Papain. These enzymes are vital to overall health, in that they assist with more efficient digestion of food; early evidence supports an anti-inflammatory effect for both Bromelain and Papain. PABA (para-aminobenzoic acid), typically taken from organ meats, is an interesting presence here; the UV-protection effect that PABA supplementation provides is relevant to a large segment of society. Each bottle of 120 capsules contains 30 servings of V/M+; interested individuals can find additional information about the product and where it can be purchased at their website (linked above). NeuFutur readers, have you had any experience with V/M+?